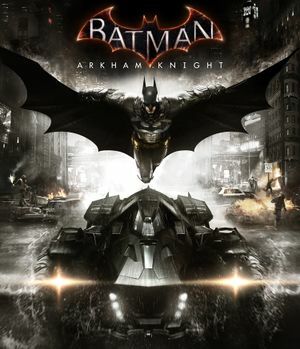 Released in a poor state, the PC port was pulled from stores on June 24, 2015, reworked and re-released on October 28, 2015. Despite post-launch efforts, reports still indicate the game to have many problems with bugs and general optimization. Adam West skin, '60s-themed Bat-tank, and Scarecrow Nightmare Challenges are PlayStation 4 exclusives. 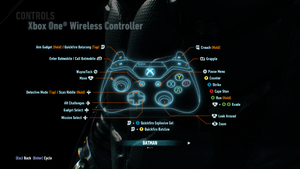 Steam user Kaldaien has compiled a comprehensive configuration guide for Arkham Knight. Users have reported improved performance, texture streaming and graphics quality. 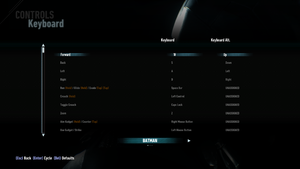 Because Batman: Arkham Knight heavily uses Nvidia PhysX, you can get a considerable framerate improvement by disabling SLI in the Nvidia control panel and assigning your second GPU to be dedicated to PhysX. 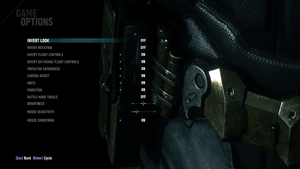 The game does not support SLI anyway, so at least with this tweak you can get a sort of 'semi-SLI' mode going. 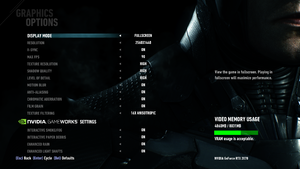 This should increase the framerate by around 25%, similar to a SLI profile with poor scaling. If you have completed the game and its various side missions but you would like to skip the incredibly time consuming task of collecting all 243 Riddler trophies, you can get a 99% complete save file here. This file has all non-DLC content completed, with the exception of the collection of the final Riddler trophy at the orphanage, so this save game will allow you to battle the Riddler and view the game's full ending after collecting just a single trophy. Works with some issues (see the WSGF entry). Has SMAA in options, but reduces images clarity. See Anti-aliasing (AA). Choice of FPS cap: 30, 60, 90. See High frame rate. Select all lines that start with "Bindings" in the [Engine.PlayerInput] section. Copy and paste it into the [BmGame.RPlayerInput] section. Higher than default values can cause much FPS drop during situations where the camera zooms out. Game is Vert- by default. Open BmEngine.ini and change "AspectRatioAxisConstraint=AspectRatio_MaintainXFOV" to "AspectRatioAxisConstraint=AspectRatio_MaintainYFOV"
May cause the map and some cutscenes to look weird. This tweak also makes the game use vertical measurement. For people who play games where the max allowed FOV is 120, you want to use hotkey values of 90 instead of 120. If you like 110 or 100, then 80 and 70 respectively. Change MaxFPS=60.000000 to have the FPS cap you want. DirectInput, XInput and DualShock 4. 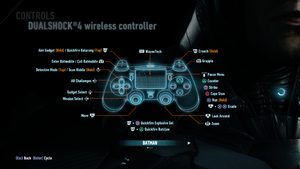 Using Logitech Rumblepad 2 show DualShock buttons. Both XInput and DualShock 4. Includes localization for Spain and Latin America, but it depends on Windows Language preferences (for Latin America, Windows language must be on Español (México), for Spain must be on any configuration of Spanish). 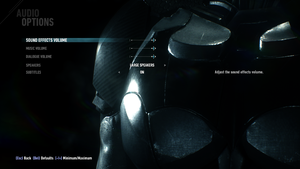 See Helix Mod: Batman Arkham Knight (DX11). Go to Update & Security, Windows Defender and scroll down until you find 'exclusions' click add an exclusion. Broadband Internet Connection required to activate and for some online features The publisher recommends using an SSD due to mechanical hard drive performance issues. For ultra setting the publisher lists an Nvidia GeForce GTX 980 and 4 GB of VRAM as the minimum requirement. The recommended requirements are only for 30FPS, not 60+ as most would expect. ↑ 3.0 3.1 File/folder structure within this directory reflects the path(s) listed for Windows and/or Steam game data (use Wine regedit to access Windows registry paths). Games with Steam Cloud support may store data in ~/.steam/steam/userdata/<user-id>/208650/ in addition to or instead of this directory. The app ID (208650) may differ in some cases. Treat backslashes as forward slashes. See the glossary page for details. Confirmed myself by blocking access to revalidate.wbgames.com. This triggered the typical Denuvo offline activation prompt. Different from other protected Steam titles is that the offline token is stored in the <Steam-folder>\userdata\<user-id>\208650\dbdata file.